The application uses a Feedback Delay Network (FDN) to create early reflections and a diffuse echo field. It is possible to create slap, flutter and clean echos by selecting appropriate values for the echo delay and gain. 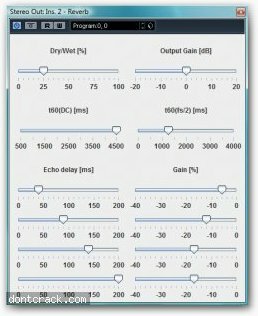 Mix between clean and reverb signal. Sets the gain level for the output signal. Defines the decay time to -60dB for the low frequency part of the signal. Defines the decay time to -60dB for the high frequency part of the signal. Sets the delay for the early reflections. Defines the amplitude of the early reflections.